Kaiji Ito is your normal run of the mill guy, penniless, spends his days working in a grocers – How could things get any worse? 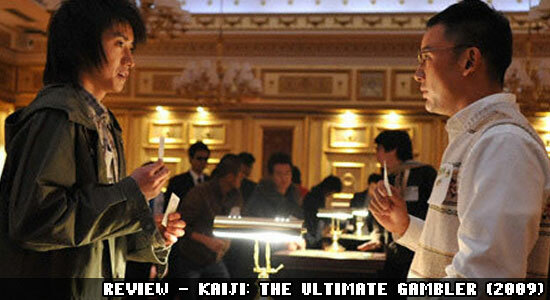 Kaiji is soon confronted by Endo, a woman who wants to collect an outstanding debt owed to her in Kaiji’s name. She gives him two options; pay the debt off over the next 11 years or join them on a mysterious cruise where he and hundreds of over people will have the chance to clear their debt in one night! Director Tôya Satô has deliver us the live-action adaptation of extremely popular Manga and Anime series. I admit when I originally received the movie and thought the movie would end after this cruise, amazingly the cruise was the tip of the iceberg! The story turns out to run along the lines of a torture game shows like The Condemned, Hostel and to a better part; Battle Royale. This movie is also highly regarded as a Death Note reunion with Tatsuya Fujiwara and Ken’ichi Matsuyama! Tatsuya being the lead has to carry the movie and of course he does do well, but this man can still really ham up a performance. A key example is when he has a beer at the end of the movie, NO ONE REACTS LIKE THAT! Compare that to a hour earlier where he is on the balancing beam himself, the grief he displays is award winning! So weird, has Battle Royale gotten him too much clought? The story is surprisingly good, I quite enjoyed each task the low lives were put through, the card games, the balancing acts. All were well thought out and all each with sinister little twists. A great tension is added to each test when the dramatic soundtrack kicks in, it gets heart beat racing, giving you the impression, He’s going to do this! Overall, a genuinely surprising movie, a must rent for any Asian cinema fan out there!